My name is Wendi, and I am probably most definitely absolutely 110% the biggest booknerd you will ever meet. *And damn proud of it, my friends! When it comes to reading, I’m Tom Hanks at Denny’s right after he got off that island with Wilson. I’ll read almost anything and everything–mysteries, serious literary fiction, fluffy chic-lit fiction, biographies, memoirs, and of course one of my favorite genres, young adult fiction. I’d like to think of myself as a flexible, curious reader, always looking to learn something, feel something and discover something new. That being said however, I do have a few quirky reading habits that I just can’t seem to shake. And I know I’m not the only one—Joey, I’m looking at you buddy. These eccentricities just go to show that reading is such an intensely personal activity; no one person does it the same way. Here are just a few of the things I find myself doing when I’m knee-deep in a good page-turner. Before I actually dive into a good book, I always read the very first sentence and the very last. When I shared this little quirk of mine with the librarian who I work with, she was a teensy bit horrified. What about the potential for spoilers? I get what’s she putting down, I do. But for me, reading the last sentence gives me just a hint of what’s to come, and piques my interest to find out how it fits in with the beginning of the book. I’m very careful to read only the very last sentence, and I try to avoid looking elsewhere on the page. There’s something suspenseful and thrilling about peeking ahead—but only just a little bit. And you thought reading wasn’t badass. The one time I can remember this backfiring on me is with the J.D. Salinger short story, “A Perfect Day for Bananafish.” If you’ve read the story, you understand. I hate folding down the page corners of a book. Hate it! I will try to McGyver a bookmark out of just about anything before taking the drastic step to dog-ear a page; old receipts, a penny, a bobbi pin, even a butter knife (don’t ask). I also hate it when books get reinvented, new and flashy covers. Some are more heartbreaking than others, like when the Harry Potter series was updated. The new covers seemed so strange and foreign to me; it was almost like it was a completely different book. The first edition I own or read will always be the best. No special new editions for this girl. I will go out of my way to get the hard cover versions of a book, even if I already own it in paperback or on my Nook. There is just something about a hard cover; it’s hard binding, it’s strength, it’s durability. Just thinking about one gets me all flushed. Some Many Most think I’m crazy-sauce for buying a book if I already have it. But it’s kind of the same thing as buying that second pair of identical jeans that you’ve already got hanging in your closet, right? Which reminds me, I need to buy more jeans. As you can imagine, I am beginning to accumulate a lot of books. A lot of books. And finally, I love when books have a price sticker on the back of the cover that you can peel off. My favorite local bookstore when I was a kid had those types of labels, and I loved bringing home a new book and peeling off the sticker. This childhood ritual has manifested itself in other areas of my life — I also love peeling the plastic protective sheet off of electronic devices and the labels off of water bottles. And don’t even get me started on those little stickers that come on your apples or bananas! I know, I don’t really get it either. But we all have our little quirks, don’t we? Question of the day: Do you have any unique quirks, reading or otherwise? 1. I had a handful (Okay. Maybe two handfuls) of Skittles at 9 o’clock this morning. 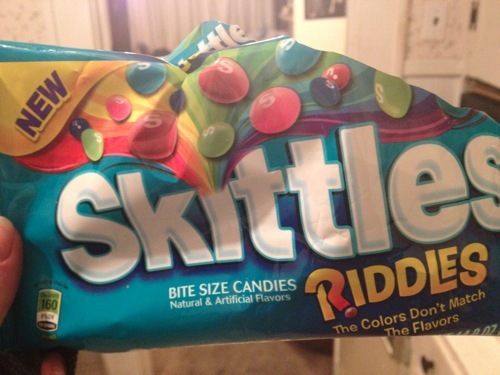 FYI: These new Skittle riddles are the best thing that have ever happened to me. Okay, maybe not ever…but they are pretty fantabulous. It takes the stress off of sSkittles eating because of the fact that with the regular packs, I eat all of my favorite flavors at the beginning and by the end just have the purples and oranges. Now I get to try and guess what flavor I am eating and not eat the best flavors first! It’s a whole new world, my friends. 2. I would never hurt a fly. Spiders on the other hand are fair game. I’ve actually become really good at squashing the 8-legged, beedy-eyed little buggers (I’ve allocated one of my Dan Brown books to do the job for me, the Acme anvil to my Wiley Coyote). I am not so good at clearing the bug guts however. My apartment has a slight spider-esque wall paper esthetic to it. I’d like to think that I am just very new-age design savvy when really I am just plain lazy. And grossed out. 3. I cannot not sing when listening to a song, whether it be on the radio, my i-Pod, the television or the loudspeaker at Target. You can imagine the problems this gets me into (I would like to apologize right now to my co-workers who have to put up with my daily karaoke jam sessions). 4. I hate the taste of mint. Abhor it, in fact. I do however love me some Thin Mints which is why for some odd-ball yet totally genius reason, I always eat a palm-full of M&M’s right before I brush my teeth. Mint=gross. Chocolate + mint = oh my goodness delicious! I know I could buy toothpaste that wasn’t mint flavored, but then I wouldn’t have a “legitimate” excuse to scarf down the melt-in-your-mouth, not-in-your-hand candies before bed. Where’s the fun in that? 5. I have a strange fear of sneezing while driving. I once worked with someone whose husband crashed into a light pole (thankfully he was okay, only a minor fender-bender) because he closed his eyes sneezing behind the wheel. I always try to see how long I can keep my eyes open when making the big “Achoo!” which coincidentally, I also have a strange fear of doing. Thankfully the myth-busters set my mind at ease on this one. Yes. I am a 10 year old boy trapped in a 27 year old woman’s body. 7. Am I the only person who thinks that sometimes, the days seem to drag onnnnnnn foeverrrrrr but the weeks go by super duper fast? 8. I’ve been counting down this work day that is seeming to drag onnnnnn foreverrrrr because it’s Taco Tuesday! The prospect of eating delicious tacos once quitting times rolls around can make any bad day a little better. Question of the day: What are your confessions?